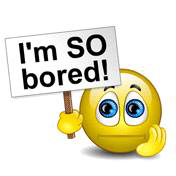 Feeling a little bored? Or is someone boring you! Share how you feel with this super popular emoticon. You’ve cleaned the kitchen, you bought stamps at the post office, you mowed the lawn, you fixed your bike, and then you marveled at your exciting life! Don’t worry—we’ve all been there. You can at least sure share your boredom easily in a Facebook message with this expressive smiley; hopefully your pals will come and rescue you from your day of ennui!